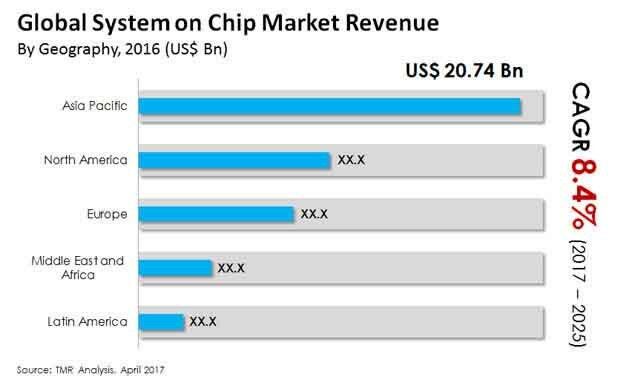 The vendor landscape of the global System on Chip (SoC) market is largely consolidated, with the leading three players collectively accounting for a massive 68% of the global market in 2016, with Qualcomm Inc. alone accounting for a huge 38.6% in the same year, observes Transparency Market Research in a recent report. The highly competitive market, with established companies having a stronghold on most key regional markets, is witnessing attempts by large companies to further consolidate the marketplace by acquiring relatively smaller companies in high-potential regional markets; Qualcomm’s acquisition of Design Art Networks is a recent instance. Companies are also increasingly focusing on the introduction of innovative products to meet the variable and complex demands from key end-use industries such as consumer electronics and telecommunications. Companies are also focusing on bringing changes in the lithographic and multiple patterning processes, to help end-users bring the factor of differentiation in their products to undermine competition and boost brand value. Transparency Market Research estimates that the global SoC market, which was pegged at US$45.89 bn in 2016, is expected to expand at a promising 8.4% CAGR from 2017 to 2025 and rise to a valuation of US$89.03 bn by 2025. Based on type, the segment of mixed-signal SoCs is presently the leading contributor of revenue to the global market, accounting for nearly 44% of the market in 2016. The segment is also expected to remain the leading segment throughout the forecast period, exhibiting a promising 9.0% CAGR from 2017 to 2025. Geographically, the APAC market for SoCs accounted for more than 45% of the global market in 2016. Factors such as the increased demand for smart electronic devices and the increasing adoption of IoT-based technologies across a number of industry verticals have been some of the key growth factors for the growth of the APAC SoC market in the past years. The mounting use of smart devices such as laptops and smartphones across the globe in the past few years has provided a huge thrust to the global SoC market. Moreover, the development of technologically advanced SoCs that house more features within a specified area, leading to better resistivity of wires and higher interconnectivity, is further driving the global SoC market. Application of these functions has resulted in the declining cost per function of integrated circuits (ICs). The lowering of costs per function of ICs has been another major driver of the global SoC market, further enhancing the applications of SoCs across different industry verticals. The vast developments in the field of ICs in recent years, allowing significant design changes in microcontrollers and microprocessors and making it possible to embed different patterns within a single chip, have also been key to the development of the global SoC market in the past few years. All these factors are likely to boost the market growth for SoC market during the forecast period from 2017 to 2025. Owing to the complex design of advanced SOCs, their manufacturing incurs huge expenses. Moreover, with growing advancement in the fabrication and lithography process along with design changes in nodes due to multiple patterning result in high software development costs as well. This factor has posed vast limitations and challenges for players in the market, acting as a key restraint for the growth of the market. Also, the overlapping of functionalities resulting from changes in consumer demands could also have a negative effect on the overall growth prospects of the global SoC market in the next few years.